An unmanned aerial vehicle (UAV), "commonly known as a drone and also referred to as an unpiloted aerial vehicle and a remotely piloted aircraft (RPA) by the International Civil Aviation Organization (ICAO), is an aircraft without a human pilot aboard." To the military, they are UAVs (Unmanned Aerial Vehicles) or RPAS (Remotely Piloted Aerial Systems). Those used by the United States Air Force and Royal Air Force range from small intelligence, surveillance and reconnaissance craft, some light enough to be launched by hand, to medium-sized armed drones and large spy planes." "Being buried alive is a scenario most of us thankfully only experience in nightmares." "Rescue teams say drones can sometimes halve search times"
"Dogs are still useful for digging out avalanche victims"
"The Intercept has obtained a cache of secret documents detailing the inner workings of the U.S. military’s assassination program in Afghanistan, Yemen, and Somalia. The documents, provided by a whistleblower, offer an unprecedented glimpse into Obama’s drone wars." 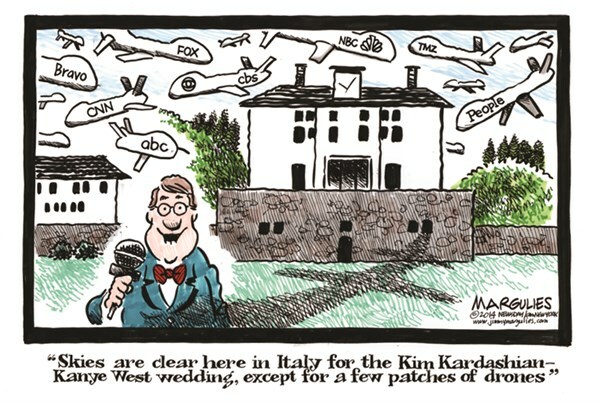 but a civil rights group worries the drones might be used to invade privacy." "Rogue drones have nearly caused air accidents, have been used as offensive weapons, to deliver drugs to prisoners, and to spy on people. So how can we fight back?" "Terrorists and violent crowd members during events like the World Cup could be spotted instantly by police using new drone surveillance tech." but they also promise to improve mobile and internet connectivity for emergency services and consumers." "India’s dabbawala network of food-carrying couriers has existed since the 1800s – but drone deliveries could provide a new way to grab lunch, in India and elsewhere." "Vodafone has created an air traffic control system for drones that could eliminate airport trespassing and drug smuggling, while bringing delivery drones a step closer to reality." "Flying drones and robots now patrol distribution warehouses - they've become workhorses of the e-commerce era online that retailers can't do without. It is driving down costs but it is also putting people out of work: what price progress?" "Defibrillator-carrying drones promise to dramatically boost survival rates for people suffering cardiac arrest after a new study found they could reach patients four times faster than an ambulance." "A U.S. company has built a new drone made almost completely out of paper, with no motor. It is designed to lower the cost of deliveries in remote parts of the world. Once a delivery is made, the drone can be thrown away or used again. " "Officials in Dubai say they plan to launch a self-flying air taxi as soon as July. The Chinese-made drone has four propeller wings. It can operate for up to 30 minutes on a single battery charge, with a flying range of 50 kilometers." "The Ehang is electric-powered and can travel for about 31 miles with a person and bag that weigh up to 100kg. Designed to be secure, the autonomous vehicle has a "fail safe" system, according to the company, that prompts it to land in the nearest place if anything malfunctions or disconnects. It also communicates via encrypted channels." The drone can carry one passenger weighing up to 100 kg (220 pounds) and has a 30 minute flight time." "Discover your inner aviator, from the entry level Parrot Mambo to the high-spec DJI Phantom." "Drones are now being used to transport blood, medicine and supplies in Rwanda and Madagascar. Zipline International, an American-based company, has begun flying blood and vaccines to Rwandan medical centers. Another company, Vayu, transports blood and laboratory test materials in Madagascar." "Some students in Virginia will soon be able to order burritos delivered by drone. The service, starting this month, will be one of the first tests of a commercial drone delivery service in the U.S."
"A U.S. drone maker is teaming up with United Parcel Service to test drones in Africa. Zipline International plans to start using its aircraft to transport blood and medicine in Rwanda later this year. The companies say the partnership will save millions of lives and provide extensive drone testing." the information will help weather experts increase the accuracy of their forecasts." "Beachgoers will be protected from sharks by drones and "smart" drum lines, according to the New South Wales (NSW) government." "Drone strikes are often controversial. They seem to allow the attacking nation to remain literally and metaphorically above the fray. Their own service personnel are not at risk. And drones also seem to blur the boundaries between warfare on the one hand and counter-terrorism and law enforcement on the other." "The use of flying drones, for all their well-documented virtues (amazing aerial photography, for one), is a fraught topic. News reports carry tales of drones flying too close to commercial airliners, drones spying into bedroom windows and drones carrying – and firing – handguns. And as legislation managing their civilian use tightens, there seems little doubt that public contempt for the machines is coming to a head." The package contained small amounts of marijuana and heroin." "Lifeguards in the US have come up with a new tool to protect beach goers from potential shark attacks. Drones with mounted cameras to spot potential problem predators are being used in California. Thankfully, French firm ECA has been quick to respond to the potential threat, building an anti-drone drone that can hunt down drones and identify their pilots." 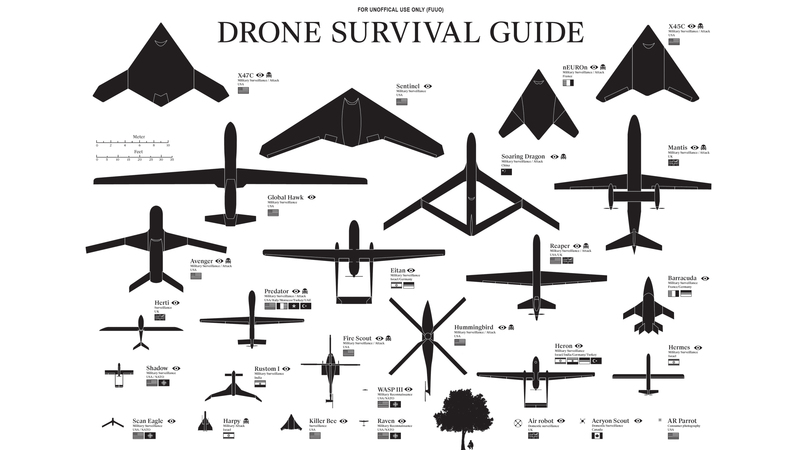 How Are Drones Used in the U.S.? "The U.S. military announced it will disable or shoot down drones that fly too close to protected areas." "Federal Aviation Administration recorded details of about 10,000 unmanned aerial vehicles a day after launching compulsory registration." "Three British companies have created a device to deter drones from entering sensitive areas by freezing them in mid-flight." according to the Ministry of Justice." "The US Federal Aviation Administration (FAA) has approved Amazon's plans to begin testing drones for online deliveries. The FAA said it had granted Amazon a certificate for people with pilot's licenses to test the unmanned aircraft. The drones must be flown at 400 feet or below during daylight hours, and must remain within sight of the pilot..."
"Should we add more humour and humanity to our gadgets? David Robson reports on a new breed of machine designed to make us love them, and discovers whether robots can make you laugh..."
"Robert Mueller said the FBI used drones for surveillance in "particular incidents"." "Lurid pictures from the last 100 years show the idea of military drones – and removing humans from the battlefield - has a long history." "The United States is thought to have launched a secret drone campaign to kill Islamic State fighters in Syria." "Royal Air Force staff operating drone aircraft in Iraq and Syria may be at greater risk of mental trauma than plane pilots, their commander has said. Long missions and cameras giving clear views of events could cause post-traumatic stress disorder, according to Wing Cdr Damian Killeen." "Conservationists are struggling to stop people who illegally hunt or catch animals, such as rhinos and elephants. They are now using DNA identification and drones to follow animals in the wild and help protect them from poachers." "In an effort to stop cheating, administrators in China took an unusual step. They used a drone, or small aircraft without a pilot. The drone flew over two testing centers in Luoyang City in central China's Henan province. The drone was looking for unusual signals being sent to wireless devices." "Amazon.com has received patent rights to send its products to customers by unmanned drone aircraft. The company is the largest U.S.-based online seller of products. But even with a patent, it does not appear the company will put its new delivery system in place any time soon." "The online store Amazon is testing a new method of delivering packages to customers. It wants to start using drones to get packages to customers, in just 30 minutes. The drones are small, remote-controlled helicopters called 'octocopters'. They look like toys." "Amazon.com is testing drones to deliver goods to homes. It says it could be four to five years before they're put to use. Bobbi Rebell reports." (see earlier posts here and here)." "Prodrone, a Japanese company, has unveiled its rather frightening PD6B-AW-ARM model with custom-developed robotic arms for completing ‘hands-on’ operations. In the wake of the launch, tech journalists and social media users have been speculating about the drone’s applications for good and, more pressingly, evil. See here for the full demonstration of the drone. "A video animation shows a design by Norman Foster for the world’s first droneport. The facility in Rwanda would support planned cargo drone routes linking remote areas in Africa: a red-line network for emergency supplies and a commercial blue-line network. The team hopes to complete the droneport in 2017." "This promotional footage from Silicon Valley tech startup Zipline shows how it would use drones to deliver emergency blood supplies. The company hopes to make up to 150 blood deliveries a day by drone in Rwanda. Difficult transport conditions mean rural health centres across Africa often lack supplies and delivering emergency blood is particularly challenging. A ‘zip’ drone can fly a 75-mile round-trip on a single charge." "Drones are operating above some of South Africa’s national parks in an attempt to deter and intercept poachers. Poaching is at record levels on the continent, devastating elephant and rhino populations. These drones can fly 2.5 hours on a single charge and up to 22 miles from the control vehicle. The operators say they have seen a direct link between their presence in an area and a fall in poaching." "New capture and removal system could help in disarming unmanned aerial vehicles carrying explosive payload, without causing them to crash." "Firefighters in Santa Barbara, California are combining consumer thermal imaging technology and drones to help monitor wildfires. Drought and high temperatures has seen large parts parts of the western US ablaze. BBC Click's Marc Cieslak reports." "Getting closer than a helicopter, higher than a crane, and as steady as a dolly - drones are fast becoming an essential part of the professional filmmaker's kit. Compact drones can now carry heavy camera equipment into the air for spectacular aerial filming and shoot rock-steady shots in the most unforgiving of environments. BBC Click's Spencer Kelly went to Norway for a demonstration from film production company Fram Film." "Amsterdam will host the first ever drone circus later this year. Rose Eveleth talks to the man behind the machines." "Real-time delivery by flying robots. Anytime. Anywhere. We're pioneering an exciting future and we want you to be a part of it. "5 live Daily's exclusive tour of the RAF base - where British aircrews sit in metal cabins on the ground, watching and attacking targets thousands of miles away..."
"Removing casualties from remote battlefields is often dangerous and highly skilled work for helicopter pilots. But a prototype air ambulance drone developed by Tactical Robotics is hoping to make these evacuations safer. Part funded by the Israel's Ministry of Defence, the AirMule, has a top speed of 120 knots (140 mph, 190 km/h) and can reach an altitude of 12,000 ft (3,600 m). BBC Click's Jen Copestake reports." "The drone revolution is over 100 years in the making. Here, we take an animated look at the past, present and future of unmanned aerial technology." "Private companies are developing smaller, more sophisticated unmanned military drones to be used for air strikes or reconnaissance missions." "Toys are getting ever more hi-tech - from robots that can research the internet to toy drones and plastic pets. BBC Click's Spencer Kelly went along to the British Toy Fair on the hunt for the must-have toys of 2015. Some 260 exhibitors were showing off their latest toy creations - many still in the prototype stage." "There are drones to help you take the perfect selfie, drones that fly themselves and drones that follow you by hooking up with your smartphone." "Technology that allows a drone to be piloted from the ground using only a person's brainwaves has been demonstrated in Portugal." "It has been a busy year for technology innovation with wearable devices, connected machines and drones all being offered to consumers. However, 2014 has also seen an increasing number of bugs and hacks affecting technology users." "BBC Click's Marc Cieslak met with BAE Systems, to see the potential future military uses for drones and also learn how the technology is being adapted to help rescue people from dangerous locations and even prevent poaching." "Hadley Malcolm hosts USA NOW for Sept. 6, 2013, on Deer Trail, Colorado to potentially becoming the first American town to pass a drone hunting ordinance. Would you go hunting for drones? One Colorado town wants to give you the chance." to search for bombs and robotic dogs that can carry hundreds of kilograms of military kit and follow soldiers over any terrain." - on display at an unmanned drone exhibition in Las Vegas this week. "Should the life of one innocent be sacrificed to save many others? That is the thematic question of director Gavin Hood’s new film, "Eye in the Sky." The Toronto film festival this autumn saw the premiere of Eye in the Sky, a topical thriller about a group of intelligence staff tasked to decide whether to target a village in order to potentially thwart a terrorist attack. The Guardian called the film ‘impressively performed and briskly efficient’ – here is the UK version of the first trailer. Eye in the Sky is released in the US on 11 March and the UK on 8 April." "Actor Ethan Hawke and director Andrew Niccol discuss their latest film, Good Kill, about an Air Force drone pilot who begins to question the ethics of his job." "En douze titres, le nouvel album du trio, Drones, retrace l’aliénation d’un soldat contraint à tuer qui finit par retrouver un semblant d’humanité et par se révolter pour retrouver sa liberté." "Drone Pilot is a protest song. All over the world drone planes are being flown, by 'X-Box Generation' men..."
"The first in a series of drone songs by Victor Villegas, aka DroneSinger, the Weird Al Yankovic of drones." "The Drone Force Song" is a parody of "Wild Blue Yonder", the U.S. Air Force song. New lyrics by Mike Delaney. www.mikedelaney.org."